I've seen this book everywhere. It was on practically every book blog I went on, mentioned in every teen magazine I flipped through, and on every recommended book shelf in every book store I visited. Did I have any other choice than to read it? After one of my friends gave me her blessing to read it, I checked it out from the library and read it. I have I wasn't expecting anything anything other than the average "Hunger Games" - esque type of dysfunctional dystopian governmental society. Even though, it's sorta in that same realm of things, it's quite different. At sixteen your supposed to choose between the five factions. There's Dauntless, for the brave, Abnegation, for the selfless, Candor, for the honest, Erudite, for the smart, and Amity for the peaceful. 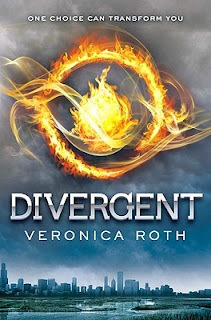 Our heroine Tris, discovers that she's different, that she's a Divergent, a term that's surrounded by mystery and the unknown. At her choosing ceremony she decides to become a Dauntless and the book is about her trying to make it past the initiation, trying to deal with the consequences of her actions, and uncovering the corruption that may or may not be lingering within her grasp. Tris's main love interest in Divergent is Four, a trainer for the Dauntless who is hiding a big secret. The book isn't romance driven like Delirium, but it doesn't have its fair share of it. You don't know what I would give to spend a day with Four, although preferably not one where he throws knives at me. The characters were wonderful and grew as the story progressed. Tris is an awesome heroine and her friends Al, Christina, Will, and everyone else add to the depth. There are also people like Eric and Peter who are two faced and keep you guessing at what deceptive thing they're going to do next. It's set in Chicago and I loved the little remainders of the city that they mentions. The Sears tower is the "Hub" and the entire area around them in walled off. The reasons being are unknown and really compelling. With the tensions between factions growing ever more tense, Divergent tells the story of the problems in a seemingly perfect society. However, I didn't really like how even though the book's pace was nice and the story was interesting, a lot of questions weren't answered. I felt that it was a great book to start off a series, but was holding a lot of stuff back so the next couple books would have something to go on. It had that whole weird cliff-hanger-but-not-really-kinda-sorta-thing going on at the end and it bugged me. Like, the overall problem hasn't been solved yet, but the main characters personal problems are all good. It's weird. I think that overall, I really liked this book. It was exciting and makes you think about what kind of person you are, and what faction do you really belong in. I loved the world it was in and I can't wait for the next book in the series!